Wanting to see a little more of Northern Italy while in the area, I take a day trip to Verona, a little town about an hour and a half out of Venice known for having a large ancient colosseum, and for being the setting of Romeo and Juliet. 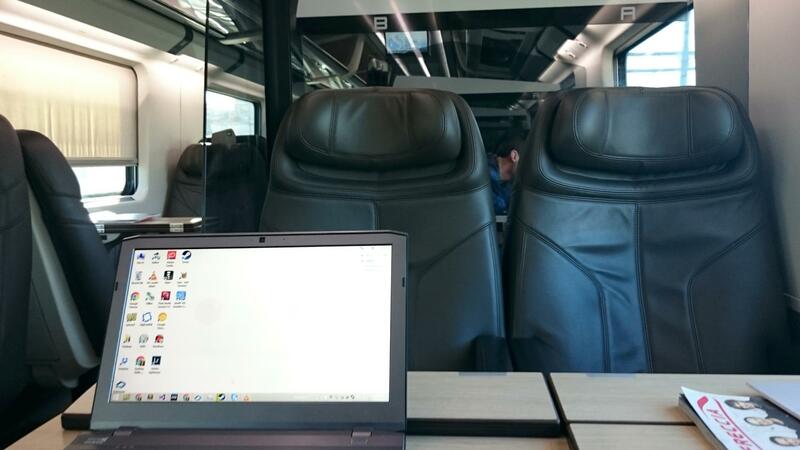 The train is quite comfortable, and I get some work done on the ride there. Once in Verona, I follow a walking tour from my guide book, which first takes me to the aforementioned colosseum, which is, I think, the second biggest Roman Colosseum in existence. Most interestingly, it is still used for holding regular events. The tour book promised I would be harassed by an Albanian gang outside the colosseum, but they appeared to have the day off. Apparently they are usually outside the colosseum, dressed as ancient gladiators, charging tourists way too much money to have their pictures taken. The police say they’d rather have the gang doing that than what gangs usually get up to, so they leave them to it. Next up, Piazza Erbe, which probably used to be a bustling marketplace, but now just has stands selling fruit cups to tourists. The most interesting spot in Verona is perhaps Juliet’s Balcony. This is the balcony upon which, according to the tour guide who built it in the 70s, Juliet Capulet was serenaded by her love Romeo. According to legend (presumably by same tour guide in the 70s), if you polish the bronze statued breast of Juliet, it’s good luck. Having seen very few tourists thus far in Verona, I am slightly surprised to find the place completely packed with tourists, so I get a picture of the silly tourists. 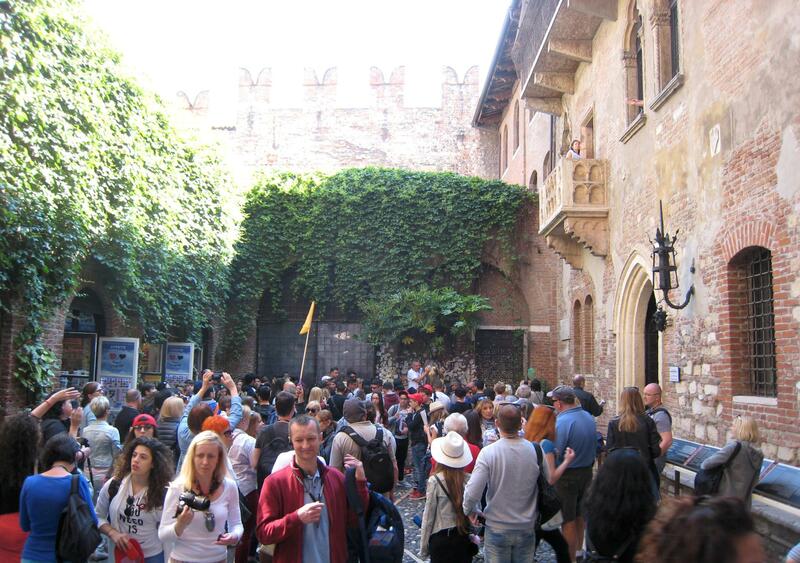 Apparently, each year, 1600 Japanese tour groups, while on tours of Italy, stop at Verona, bypassing all of the historic sights, just to visit Juliet’s balcony, before loading back on their buses and proceeding to Venice or Rome. I learn that a prominent group in Verona’s history is the Scaligere Family. Prior to their securing of power (which I think didn’t last very long), the powerful families would vie for position by building towers higher than the other families. During the Scaligere reign, they tore down all of the towers except for their own. I take a picture of a tower, I do not remember if it was theirs, or something built later… Another icon of Verona is Dante, who lived there, and wrote The Divine Comedy there, after being exiled from Florence. A statue of Dante is found in another square I pass through on my way to the very ornate and Gothic Tomb of the Scaligere. One of the most ornate and interesting churches in Verona is Santa Anastasia. It is very unassuming (and, in fact, unfinished) on the outside, but gorgeous inside. After having spent a few days in Venice successfully getting around without relying on my GPS, I had decided to not use it in Verona for the day. My guide book does have a little map for the walking tour, but beyond that I manage to make it the whole day without using Google Maps, or any kind of map, making me feel a bit better about wandering around foreign cities. Verona is a bit easy as there’s a river surrounding most of the interesting bits (probably made it very defensible in ages past), and I walk along this river taking in some views before coming to another church of note. This church, like so many European churches, was built on the ruins of an older church. What is interesting is that it has an archaeological site within it – one of the chapels is built around this site, so in the middle of the chapel, between the congregation and the altar, is an opening to the excavated ruins of an older church. Interesting in theory, but not actually all that interesting to look at. I then head to my final site I wish to see, Scaligere Castle, but not before grabbing a meal of what was described as “Tomato and Basil Salad”. It turns out to be exactly as described, consisting solely of tomatoes and basil, but I was hoping for a bit more variety. Well, at least it was covered in oil and came with bread. This castle, built by the (perhaps justly) paranoid Scaligere family, features an unusual internal moat, which separated the garrison (where the soldiers lived) from the family housings, as they feared their own troops would be turned against them. The castle is pretty cool. I think I like castles. I feel the urge to play Castles, which I remember fondly playing on my family’s 286, but I doubt it’s actually a good game, so refrain from playing it and spoiling the memory. Behind the castle is an nice looking old bridge, with many modern day Romeo and Juliets, and the ever-present selfie stick salesmen. I end the day trip by sitting in a comfortable outdoor cafe and ordering some bruschetta, which, in retrospect is the same thing I had for lunch – tomatoes, basil, and bread, covered in oil. Japanese tourists are very… efficient… about the way they do tours. It’s really kind of crazy! I am amused by your tomato, basil and bread permutations! I’m glad someone was amused! I was amused, but my stomach less so ^_^.